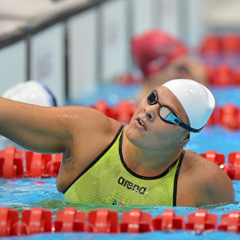 Cape Town - South Africa's Natalie du Toit has won the gold medal in the women's 200m individual medley SM9 at the London Paralympics on Thursday evening. Du Toit eased clear in a time of 2:34.22 to claim her 13th Paralympic gold medal and third at these Games after earlier wins in the 100m butterfly S9 and 400m freestyle S9. She also holds the world record in this event, with her 2:27.83 standing since the 2008 Beijing Games. Almost two seconds behind Du Toit was Britain's Stephanie Millward in 2:36.21, while another Brit, Louise Watkin, won bronze in 2:37.79. Earlier on Thursday, Du Toit qualified fastest for the early evening final in a time of 2:36.92 - well ahead of second-quickest qualifier, Millward (2:38.47). Du Toit's gold pushed South Africa's medal tally up to the 18 mark (5 Gold, 5 Silver, 8 bronze).